BERLIN CENTER, Ohio — Levi Smith and Ian Hames led the first meeting of Western Reserve Rangers 4-H club when the club met Jan. 10. 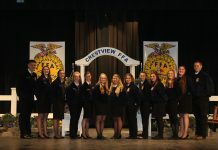 Levi and Emily Smith, Jena and Erin Styka, and Gabriella and Nickolas Marinesky will serve on the Mahoning County Junior Fair Board this year. Emily and Levi reported on the sessions they enjoyed at the 2013 Junior Fair Conference in Columbus. A thank you note was read from Hope 4 Women International for the pillowcase dresses members made in July 2012 for Dress A Girl Around The World. Members were encouraged to attend the Ohio 4-H Teen Conference in Columbus March 9. The club will meet again Feb. 14 at 7 p.m. Registration forms must be submitted by this date. MOUNDSVILLE, W.Va. –The Ridge Runners 4-H Club met at the Roberts Ridge Volunteer Fire Department’ s social hall Jan.7. Kyle Clark called the meeting to order. Shooting sports scheduled practice for Jan. 13, 14, 17, 20, and 21. Jan. 25 is competition at Flatwoods, W.Va.
January 18 is The registration deadline for teen leaders/charting members weekend is Jan. 18. February 7 is the next meeting for The Goat and Rabbit Club will meet Feb. 7 and April 11 is the bredding date for market rabbits. Camp dates are June 10-14 for senior camp and June 17-21 for junior camp. The Marshall County Fair begins July 21. Jackson’s Mill Dairy Show is set for Aug. 10-13. Also upcoming is a poster workshop, but the date had not been set. It was announced that Cameron and Walker Holmes received state recognition for their poster entries from last year. Annette Clark, the club’s leader, reminded the members that their talks and demonstrations can be started at any time. The next meeting was set for 6:30 p.m. Feb. 12 at the Roberts Ridge Volunteer Fire Department’s social hall.